More often than not, when someone sits down to write copy for a new website, they open a blank page and start typing. What they don’t seem to realize is that they’re starting with the last step of the process instead of the first step. What if they were to take that backward approach when assembling that hutch from Ikea? Right, they’d end up with a mess. But if they didn’t know what a finished hutch was supposed to look like, maybe they’d think they did a good job. So lets look at what absolutely must come first before writing the copy for your new business site. Start with the pile of informative and insightful notes you took during the in-depth Discovery process. That’s a topic I’ll cover in a future post. For now, create a separate Word doc for each of the pages, sections or major topics in your website. Writing web copy starts with rewriting your notes, but this time, you’ll be adding each point to the appropriate page, section or topic. As you go along, you’ll cross off those points on your original notes. Don’t worry about final wording yet, but do think about the connections you can make between what your company offers, and delighted customers. Feel free to jot down additional points that bubble up in your brain, in the appropriate category of course. Done? Good job. Now let’s prioritize. Go through the first page or topic, and based on what you know about the needs and goals of your customers, start assigning a rank to each of the points. Number Ones will be the most important benefit points – the ones that solve or address the most pressing issues that buyers are grappling with. Number Twos are points that show why your approach is better than what most of your competitors have to offer, or why it’s smarter than attempting to go it alone. Number Threes are going to be supporting points for the Ones and Twos, covering related or minor benefits. Number Fours will be, well, what’s left over. They may say something about the company or its process, but they don’t directly tie into a benefit, or the reasons that customers might choose you. For the first web page or section, craft your Number One points into smart, compelling headlines. Your Number Twos will be written either as sub-heads sitting under your main headlines, or headers for smaller topic-blocks. Your Threes will be arranged in a logical order as you write your body text. One point per paragraph. Your Number Fours? Dump ‘em. If they’re not important enough to actively steer folks in your direction, they’ll just distract them from all the great benefits that will. Then do the same for the other pages or sections. So, categorize, then prioritize, then write. In that order. If you found that one of your categories ended up with way too much stuff, then split it into 2 or 3 categories that are more specific. On the other hand, if a category didn’t get much love at all, discard it and redistribute its contents. 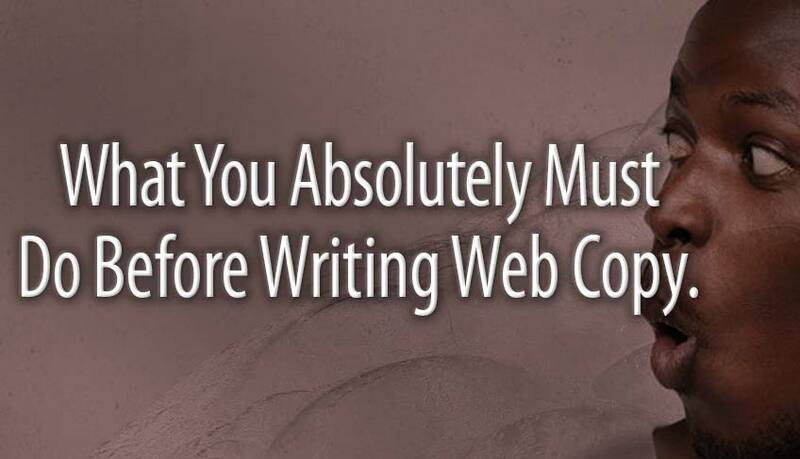 The final finishing step of writing web copy is to polish it up. Maybe make headlines and paragraph openers more intriguing and less obvious. Smooth out complex sentences, eliminate marginal points, and add any useful sub-points that you hadn’t thought of til now. Be sure your closing words are a perfect set-up for the call-to-action that follows. Then proofread it. Then get someone else to proofread it, to find the mistakes you missed when you proofread it. Looking back, you may realize that a whole lot of work got done during the rewriting of the notes. It becomes obvious at that point that just sitting down and scribbling out copy without all the prep steps could never have achieved what you just accomplished. If you use this approach to writing web copy, and apply what you just learned with focus and diligence, you should now have a lean copy draft that is overall strategically on target. Is this process workable for any web website? Of course. Is it easy? Of course not. The biggest challenge is separating yourself from your own knowledge, biases and point-of-view as a business insider, and instead wearing the customer’s hat while you do all that categorizing and prioritizing. Anyway, for some fresh and lively examples of carefully thought-through copywriting, check out 14 Copywriting Examples From Businesses With Incredible Copywriters from the Hubspot blog. And if you’d like someone else to do all that categorizing and prioritizing for you, well, let’s talk about it.